UVic Women in Science presents an interview series highlighting women in the scientific community on Vancouver Island. Becky Miller is a M.Sc. student in the School of Environmental Studies at the University of Victoria. Her research focuses on how forest structure moderates the exchange of nutrients between ocean and land. She is actively involved in 100 Islands Project and fundraising for her research by participating in tree climbing. Becky climbing a tree in the H.J. Andrews Long Term Ecological Research Forest in Blue River, Oregon while working on her Bachelor's project. Photo courtesy of Becky Miller. What is your field of study and what stage of your education/career are you at? I am a temperate forest ecologist. I completed my Bachelor’s of Science at Oregon State University in Bioresource Research. I am currently pursuing a Master’s of Science in Environmental Studies at the University of Victoria. I am also an independent contractor conducting ecosystem monitoring projects in US National Forests. When did you first become excited about science? My community college botany instructor was amazing. In class, we conducted mini-research projects, participated in invasive species removal and site restoration, and learned about ecology. Her love of science and botany was evident through her teaching but also through her lifestyle. Besides teaching, she also promoted science and generated community engagement in ecosystem restoration. She was my first real example of a female scientist. I was intrigued by her ability to work on something she was excited about and make a difference. How did you get to the position you are in today? Was it a straightforward career trajectory? I often joke that my life path was more like a winding mountain road - definitely not a straightforward career trajectory. When I finished high school, I moved out of my small community to a large city and worked in an entry-level job for six years. After this time, I was still living pay check to pay check, didn’t like my job, and felt like I was stuck in a dead end. So, I decided to move to a new city, enroll in community college and try to carve out another path for my life. In college, I met an amazing botany instructor, who later became my mentor and friend. After completing my prerequisite courses, I transferred to the biology department at Oregon State University. After my first term, I felt lost in such a large department. I wanted to work in botany or ecology and be involved in research. I ended up transferring to a small department called Bioresource Research, where I immediately felt at home. My academic advisor was fantastic, she helped each student in that department reach their full potential. While completing my undergraduate degree, I met several more influential mentors, worked on multiple research projects, and developed valuable skills. All of this prepared me for the graduate degree I’m currently pursuing. Describe your research focus. Broadly speaking, I study how forest structure influences ecosystem function. Forest structure describes the characteristics of a forest, such as species composition, tree height, and tree density. This structure tells us about the ecosystem’s history and is the foundation for wildlife habitats. I’ve explored this theme through many projects but I currently focus my efforts on two projects. I help run a landscape scale monitoring program that studies how forest restoration efforts, such as thinning and prescribed burning, changes forest structure and influences understory vegetation, wildfire behaviour and forest health. This project takes place in the dry, Ponderosa pine forests of eastern Oregon. Wildfire is a natural process in this region, but decades of fire suppression and forest management practices have altered forest structure from natural conditions. We are attempting to restore forests to more natural structural conditions and influence overall ecosystem health. The fire picture was taken at the McDonald-Dunn Research Forest. The prescribed burn was being used to control false brome (Brachypodium sylvaticum) which is an invasive grass species. Photo courtesy: Becky Miller. My University of Victoria graduate research takes place on islands in coastal British Columbia. Here, I study how forest structure influences the movement of nutrients from the ocean to land. In coastal British Columbia, forests support a wide range of terrestrial organisms that hunt, forage, or harvest materials from the marine environment. These organisms, such as wolves, river otters, and bald eagles subsequently transport marine-derived nutrients to the terrestrial systems. These cross-ecosystem interactions are embedded within forested conditions, yet very little is known about what role forests play in regulating the distribution of marine-derived nutrients. I work with a large team of graduate students and principal investigators on the 100 Islands Project to document how ecologically important this nutrient flow is for coastal ecosystems. What do you enjoy about this field/your work? I absolutely love working in the forest. Ecology often requires a significant fieldwork component to gather data, which is my favourite part of the job. For the last seven years, I’ve spent at least three months every year doing field research- no internet, no cell reception, each day spent measuring and studying plants and trees. Every day I see something new or unusual in the forest. Sometimes it’s as simple as finding a massive, 800-year-old tree that no one else knows about or a plant growing in an unexpected place. I’ve also seen wildfire consume thousands of acres and watched vegetation recover in a matter of months. All this is to say that time spent in the field is so valuable, and I’m really thankful that this field provides so many opportunities to learn from nature. What have been the obstacles for you during your education/career? Do you believe any one of these were specific to being a female? Figuring out a way to pay for school is always a challenge. I actually found that as a woman, especially a woman who started school at a later age than most, I was eligible for quite a few scholarships. Although forest management is still a male-dominated field, forest ecology seems to be a more balanced mix between men and women. What do you think about mentorship? Have you had any strong mentors during your career? And do you think it’s an important component of professional development? Mentorship has made all the difference in my life. I am incredibly thankful for the biologists and ecologists who have supported me through friendship, encouragement, and challenging conversation. University courses were useful for exposure to ecological concepts, but my mentors were the ones who really guided me as a scientist. The relationship that is built between a mentor and mentee makes space for asking questions, feeling vulnerable, and sharing career experience. I feel so much more prepared to work as a scientist because of the insight I’ve gained from my mentors. What are your interests outside of school? Have you engaged in science communications of any sort here? I became a forest ecologist because I love spending time in the forest. I spend my free time in the forest hiking, backpacking, and foraging for food. I am also a tree climber, so I use ropes and mechanical devices to ascend into the canopy of old growth forests. Most of my science communication has been work-related, but I do participate in recreational tree climbing events. Imposter syndrome is quite prevalent in female scientists. Is this something you’ve observed during your career? Do you experience it? What do you think we can do to counter it? I absolutely experience imposter syndrome. The more I learn about forest ecology, the more I realize that there is so much I don’t know. When you really immerse yourself in a discipline, you become more aware of the complexity and breadth of that discipline and the skills needed to be successful. There are many responsibilities and lines of thought that you need to simultaneously pursue in science, sometimes it makes me feel like I’m in over my head. I received some good advice about how to get through those low points: start an “accomplishments” jar. Write down each of your daily accomplishments on pieces of paper and put them in the jar, even seemingly trivial things like, “read the four journal articles I’ve been meaning to read”. It sounded kind of silly when I heard about it, but you’ll be surprised at how quickly that jar fills up. It’s a good visual reminder that you are making progress even during the times where you feel like an imposter. Unfortunately, imposter syndrome is quite prevalent and it can really detract from productivity and hinder your growth as a scientist. I think we would all benefit by simply talking about it more often. I attended a talk about imposter syndrome given by a successful female professor and it was such a relief to hear an outwardly successful woman talk about her internal struggles. One of the most memorable parts of the talk was a figure based on survey data that showed the emotional or mental state (overwhelmed, imposter syndrome, a slight increase in understanding, confidence, etc.) in relation to stages of graduate school (hypothesis development, data collection, thesis, etc.). It was a great reminder that I wasn’t the only one feeling like I was on a rollercoaster. How do you see yourself in 10 years? I anticipate working for an organization like The Nature Conservancy, where I can be active in forest or fire ecology and community engagement. I really appreciate their approach to land management, in particular, their dedication to bringing multiple stakeholders together to manage a landscape in a way that’s ecologically and socially relevant. On a personal level, I love mountainous landscapes and so I imagine I’ll be tucked away in a small town in foothills or mountains somewhere west of the Rockies. What has been your greatest accomplishment in your education/career? Two accomplishments come to my mind. The first was completing an independent research project as an undergraduate student. I studied how microclimate influences the timing of spring growth in Douglas-fir. To do this, I learned how to climb old growth trees with ropes and mechanical ascenders, how to operate a thermal infrared camera and microclimate station, and taught myself to code and analyze data in Matlab. It was difficult juggling coursework, research, and several side projects. I remember one time, in particular, laying on the floor of my cabin having worked an 18 hour day, feeling utterly exhausted and questioning why I was doing this to myself. But the exhaustion that comes from pushing yourself physically and mentally is so fulfilling. In that same moment, I felt incredibly proud of what I had accomplished and that fueled me throughout the end of the project. The second accomplishment was realizing that my original graduate school arrangement wasn’t the right fit for me. I had put a lot of time and money into getting the position so it was a hard decision to change my plan. I’m really proud of myself for listening to my instincts, thinking deeply about my decision, and being brave enough to extricate myself from the situation. What are you still hoping to accomplish? Curiosity and a sense of adventure seem to be common personality traits in scientists, so this is a tough question. There’s so much I want to see and do! I would like to improve my tree climbing skills. I’ve really enjoyed climbing for fundraising events with Expedition Old Growth and hope to organize more recreational climbs with them. It’s a great way for me to share the importance of old growth forests with the public and continue playing in the forest canopy. I would also like to participate in more prescribed burning. I was able to help on a prescribed burn for another graduate student’s project and have to admit, it was incredibly fun to light things on fire! I typically study tree and vegetation recovery in post-fire conditions but it would be fantastic to help return this natural disturbance to forest systems. 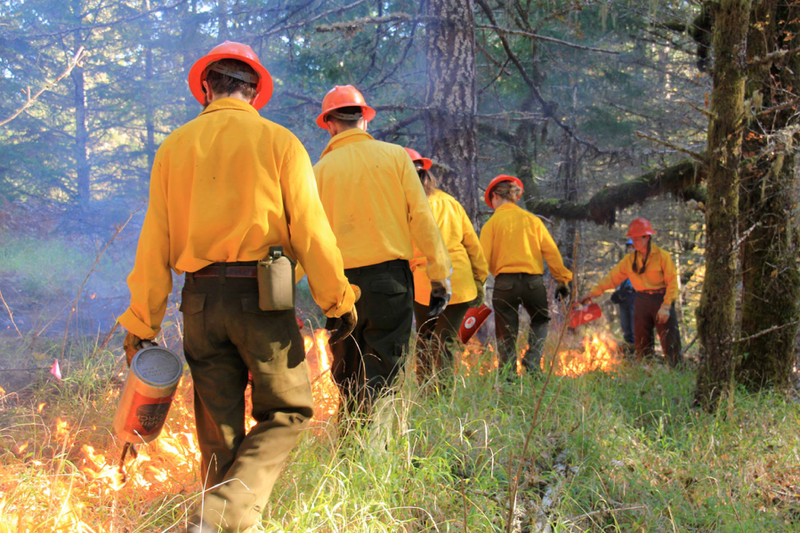 The TREX program offers some really great training opportunities, even some specifically geared toward women working in wildland fire. How do you contribute to supporting female scientists that are following in the same path as you? My career was shaped and continues to be shaped, by my mentors. I try to pay that forward by acting as a mentor to other young scientists. This mentorship isn’t necessarily female specific but I try to make myself available for brainstorming, skills training, and most importantly encouragement. This year I have an all female field crew conducting my restoration monitoring project and my goal is to facilitate as many training opportunities as possible – chainsaw practice, vegetation identification workshops, etc. Practical experience is so important for conducting field research or acquiring technician positions, so my hope is that women working for me come away with the skill set and confidence to pursue careers in forest ecology. What advice would you give to students and young females interested in science? Don’t be afraid to pursue an interest, even if it’s short-lived or seemingly unrelated to science. While conducting my own research, I have relied on problem-solving skills and lessons learned outside of science more times than I can count. These experiences have made me a better scientist. Secondly, be brave and reach out to people working in the field you’re interested in. Ask them how they got to where they are today, why and how they do their work. Most people are happy to share their experience, especially if it can help someone develop their own path to a scientific career. What programs/events would you see as being most useful for women in science here at Uvic? I would really like to see events focused on field sampling techniques and study design. These practical skills can really help students acquire their first work or research position in science. There always seems to be a problem of needing experience before you’re able to get that first job but needing a job to gain the experience. I think events like this would go a long way in preparing women for working in science.